This organ is the property of Julian Berkeley, and was formerly for many years the property of Lord Grantley at Markenfield Hall. It is not known how it came to be there. 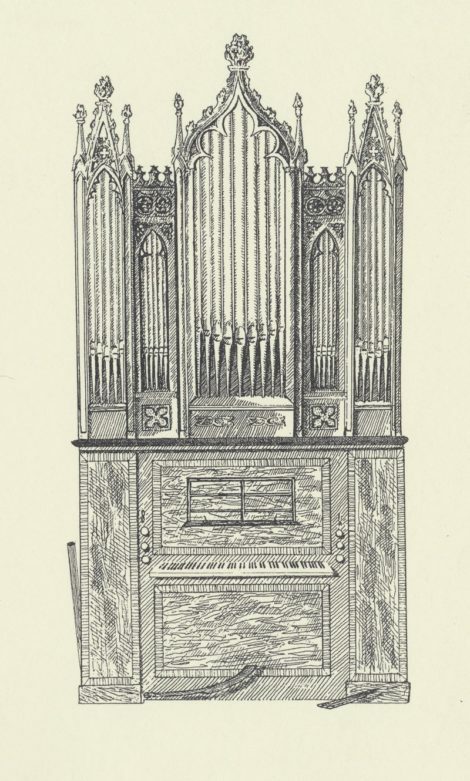 The organ was probably made by James Bruce and William Townsend in collaboration, according to Alan Buchan (Early nineteenth-century Scottish chamber organs: pipe markings and other identifiers in BIOS Journal vol21 pp136-159 1997). If Buchan is right, it would date from around 1840. It has hardly been altered. It was restored by Edward Bennett in 1993; flooding the soundboard and re-leathering the pallets, and undertaking many repairs, to the larger metal pipes, to the keys, making some new stickers, re-leathering the feeder bellows, and repairing the case ornaments. There is a shifting movement. There is a foot pedal for the player and a handle for an assistant to fill the bellows. There is a swell front, partly glazed as was often the case with these Scottish chamber organs. The compass is GG to g³ without GG#. The stops are divided at bº/c¹. The keyboard slides into the case. It has ivory naturals and ebony sharps. The case is a light-coloured mahogany, with furniture-Gothic ornament. The case measures 3530mm tall, 1736mm wide and 730mm deep. It is drawn here by Meredith Ramsbotham.